New Delhi: Prime Minister Narendra Modi on Tuesday paid homage to Bharat Ratna Atal Bihari Vajpayee and said the country ought to reiterate its commitment towards creating the India, the poet-politician dreamt of. "Tributes to Atal Ji on his Jayanti. We reiterate our commitment towards creating the India he dreamt of," Mr Modi tweeted.In an audio visual capsule attached to the tweet, Mr Modi hailed former Prime Minister's achievements in multiple fronts and also recalled that among other things, it was Vajpayee who had given the right leadership in making the country Nuclear power. "Vajpayee's words were not only the words of a BJP leader. When he spoke, it reflected the national mood....Atalji bol rahen haen, matlab Desh bol raha hae," Prime Minister says in the audio-visual piece. "Vajpayee's words created a faith amongst people. 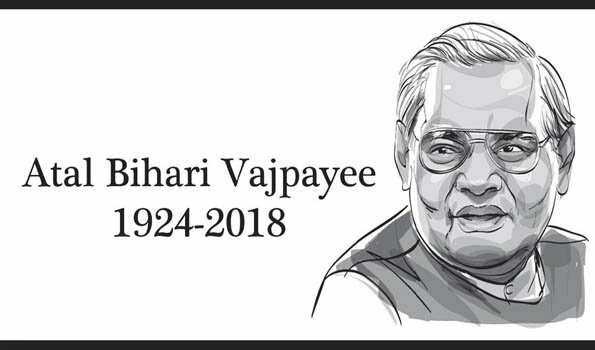 These also show Vajpayee's decades of struggle in nation building," Mr Modi says.Born on December 25, 1924, Vajpayee breathed his last on August 16 this year.In another missive in the micro blogging site, Prime Minister paid tributes to freedom fighter and three time president of Indian National Congress.He was respectfully addressed as Pandit Madan Mohan Malaviya and also addressed as 'Mahamana'.